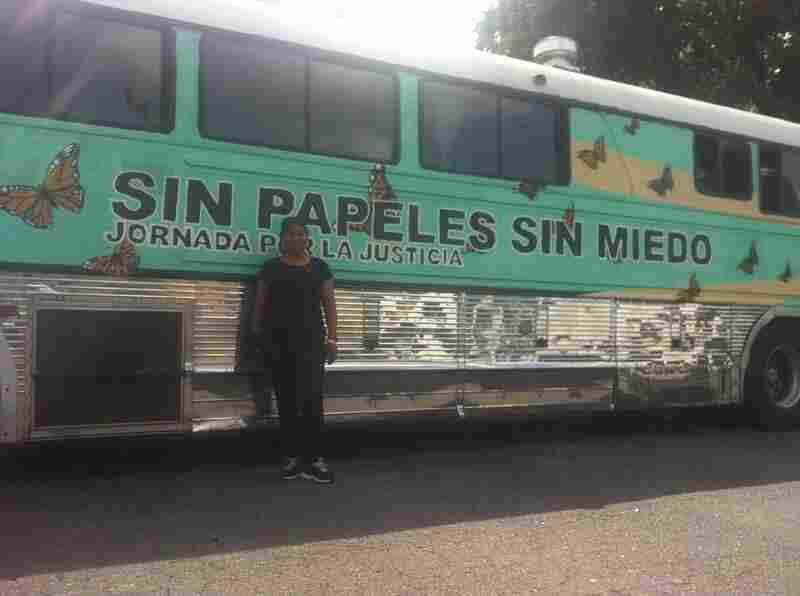 The Undocumented Bus: In Charlotte, A Different Kind Of Coming Out : It's All Politics A new generation of immigration activists are flaunting their illegal status and are pushing reform as a human rights issue. The activists participated in a march that snaked through Charlotte on Sunday, and by Monday, they had moved to a church that was hosting them about eight miles from the city. That's where I met 21-year-old Fernando López. He came to the country illegally when he was in his teens. He came to the U.S. to reunite with his brother, whom he had not seen in 10 years. But then he was stopped for a traffic violation in Arizona, and ended up in jail and with deportation orders. "This bus," he said, "is just a bit of civil disobedience." It's a bold statement for sure. 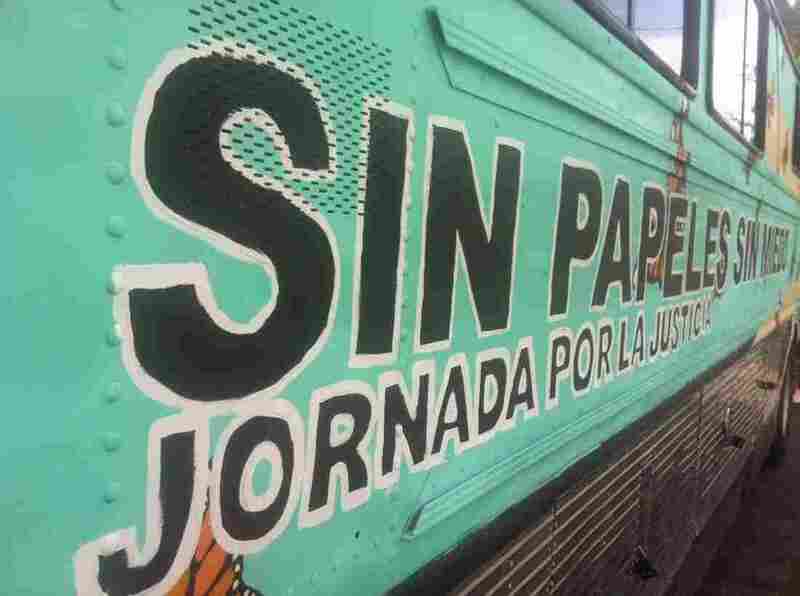 The "no papers, no fear" refrain emerged from the activists fighting the stringent anti-immigration laws that were first passed in Arizona. If you remember, it was in June of last year that Jose Antonio Vargas, a prominent journalist, came out as an illegal immigrant in a splashy New York Times Magazine piece. That propelled a generation of young immigrants who were educated in the United States to declare publicly that they were in the country illegally. It put pressure on the White House, and earlier this summer, Obama announced that he was ordering a stop to the deportation of some young immigrants. This bus tour — called the Undocu-Bus — is a kind of culmination of the movement. "We have been traveling like this for over a month, and we have gotten a lot of attention, and I think we're showing that we have no fear," he said. "As one writer said, 'When we lose fear, they lose their power.' They can't really intimidate us anymore." López walks into the bus. It's incredibly hot. Within minutes, there's sweat running down his forehead. He walks through it showing it off like a proud parent. "Priscila" is her name, he says. There are four small couches, and toward the back there's a fridge that doesn't work and a stove that doesn't work. López says the six-week cross-country trek has been uncomfortable at times, but it's doing its job, bringing attention to an issue that he says comes up every election cycle, but never gets addressed. "Were not here to beg or to ask, like we have been doing for many years, for immigration reform," he said. "We're here to put an option to President Obama on the table, which is to be on the right side of history." Maria Cruz Ramírez, 46, rode on the Undo-bus for six weeks. Maria Cruz Ramírez, 46, was also on the bus. She said that in the past, she would reveal her legal status quietly. But increasingly, aggressive laws in different states, she said, have made her more vocal. She has three kids — two of them college-age, all of them undocumented. She says along the way, she's learned a lot about organizing and mobilizing a community. She said they met with some black civil rights leaders, and in some ways that helps explains the new, uncompromising message they're sending with this bus tour. Ramírez certainly uses the arguments that immigration reform proponents have used for years. She says that immigrants come to the United States to work, and all she wants is a "dignified existence." But when I ask her if she's not afraid that by riding on that bus she might end up deported to her native Mexico, she gives a firm response. "No," she said. "I'm not scared, because this is a question of human rights." She points to the bus. Along with the refrain, the group painted monarch butterflies. Like many of the people in the group, Ramírez is also wearing a monarch butterfly pin. The butterflies have become their symbol, because every year they trek from the United States to Mexico, unimpeded by borders or policy.